All descriptions are taken from the magazine's website. 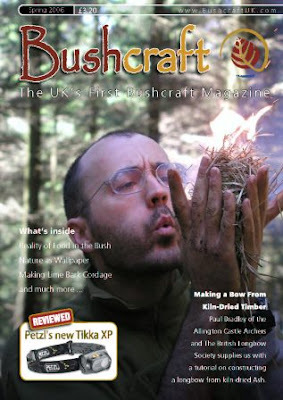 Bushcraft, is an A5, high quality, full gloss magazine so it's easy to carry and it's going to last. Best of all - it's cram-packed with great content from experts and enthusiasts who just love the outdoors. 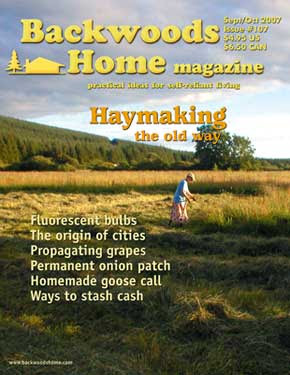 Bushcraft magazine is dedicated to life in the outdoors and obtaining all you can from it. Bushcraft is the art of confidence in the outdoors obtained through the study of age old skills and wisdom, enabling you to make the best use of modern technology without becoming dependent upon it for your enjoyment of the natural world. Things have come a long way and over the coming months and years the magazine will grow and evolve. The input from you the reader, is hugely valuable in making it a great magazine and we welcome feedback so that we can keep the tweaking and refining process ongoing. The Bushcraft UK website and Bushcraft the Magazine will complement each other in a very real way, so that there's more information, knowledge and skills readily available to all. This magazine is written for you, enjoy it. Interest in bushcraft is at an all time high, its profile being raised by the new availability of information and of course the Ray Mears television series. Bushcraft & Survival Skills Magazine is a valuable resource; enhancing your existing knowledge, teaching you new skills, answering your questions and keeping you up to date with courses and equipment suited to bushcraft use. Throughout the pages of Bushcraft & Survival Skills magazine you will find Regular and Feature Articles on subjects such as Tracking, Knives & Axes, Foraging, Flint Knapping, Fire Lighting, Wood Lore and Surviving in the Wild, alongside 'How to...' articles showing you how to make your own kit and projects that use natures resources. There are Book Reviews, Course Reviews & Kit Reviews to help you select and buy wisely, Course, Schools & Store Directories telling you what's happening and when along with where to go for training and kit, Reader giveaways and Competitions enabling you to get hold of some great kit. Most important, is a chance for you to have your say! We welcome readers questions to put to our ‘Ask our Expert’ panel, send in your ‘readers letters’, articles and photographs, this magazine is yours, own it! 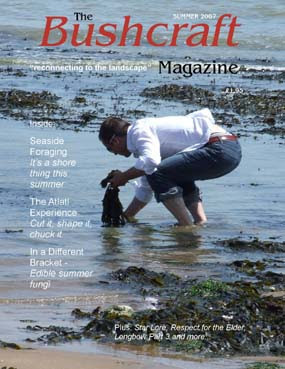 The Bushcraft Magazine is the first UK magazine to deal with bushcraft as a subject in its own right. 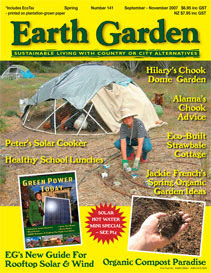 Covering a wide range of bushcraft topics from Arrow to Yarrow, it is printed quarterly. The Backwoodsman magazine is a bi-monthly publication dedicated to the preservation of Old Frontier living, primitive hunting and fishing, tool and weapons lore, and wilderness survival. Each issue is packed with information, projects and adventures associated with this unique period of North American history. The purpose of the Society of Primitive Technology is: 1) to promote the practice and teaching of aboriginal skills; 2) to foster communication between teachers and practitioners; and 3) to set standards for authenticity, ethics and quality. The Bulletin is to serve as a means of accomplishing these goals. Statement of Purpose: The primary activity of the organization is to promote the practice and teaching of primitive technology. Promotion entails both educating and informing any and all interested parties on a wide range of primitive/aboriginal life skills as well as setting standards for authenticity, ethics, and quality. Aboriginal life skills are defined here as those traditional technological skills which primitive peoples of any location, from the equator to the arctics, East to West, and of any time period, Paleolithic to post-contact, practiced or are still practicing, in order to perpetuate or to improve the quality of their lives. Generally this definition embraces pre-literate, pre-industrial lifeways, although some such traditional life skills may occassionally be found interwoven with advanced technological societies. Because of a rapidly rising interest in primitive technology, among technologically advanced peoples, as a means of improving the quality of life on earth today, both advocationally and vocationally, the time came for an organization to be created to help mobilize this interest and promote the above activity. Accordingly in 1988, a proposal for an organization to be formed the following year was distributed to national leaders in the field. In November of 1989 a meeting of these leaders was held (at the Schiele Museum of Natural History in Gastonia, NC), a Board of Directors was created, and a society was formed. A statement of purpose was drafted and a means proposed for implementation of the society's goals. Since then, annual board meetings have been held each year at varying locations around the country to facilitate the maintenance of the society. 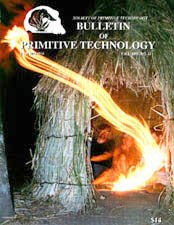 To date, this has included incorporating with non-profit status and the creation of four publications, the Bulletin of Primitive Technology, the short-lived Primitive Technology Newsletter, and our books Primitive Technology I: A Book of Earth Skills, and Primitive Technology II: Ancestral Skills. The Board of Directors and its appointees are the ones responsible for implementing all of the above. The principle purpose of the organization, therefore, is to try and help improve the quality of life of its members by providing access to the knowledge embraced by the field of primitive technology. alternatives for country and city. 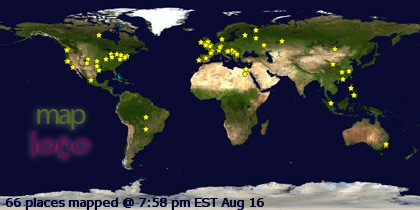 Now in our 35th year! In Wilderness Way , you will learn primitive skills that have been used for thousands of years, yet forgotten by our modern culture. 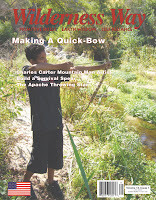 Wilderness Way magazine opens a door to a simpler time and the techniques of how man lived. Inside you will find secrets to making friction fires, primitive shelters, plant cordage, atlatls (spears), birch canoes, teepees and much more.